The airport operator of Surabaya-Juanda International Airport, Indonesia, planned to perform runway maintenance that would be conducted at night after the runway operation. On 11 June 2014, between 0100 to 0500 LT, runway maintenance was performed by a group of 10 workers, using tools including pneumatic compressor, jack hammer, chisel, high air pressure hose, asphalt mixer, small container for asphalt mixture, debris sweeper and other supporting equipment. At 04:05 LT, the Airport Facility Readiness personnel conducted a runway readiness check in conjunction with patrolling the airside using a patrol car. At 04:30 LT, they reported to the Juanda Tower controller that the runway was clear from any hazard except the area near intersection N3 where the runway repair was still in progress. At 04:50 LT, the airport maintenance team reported to Juanda Tower controller that the runway repair had finished and the runway maintenance team had left the runway. No runway inspection was performed after the runway repair finished. The airport opened for traffic at 05:00 as planned. Until 06:06 hours, a total of eleven aircraft departed and one aircraft arrived. No pilot reported any foreign objects on the runway. The first pilot report of objects was near the intersection taxiway N5 and was made at 06:09 LT which was after sunrise at 05:59 LT. At 06:15 LT, the controller contacted the Airport Facility Readiness personnel but received no reply. Thereafter the controller contacted the ARFF personnel and informed them of the pilot report of an object on the runway and requested a check. When the ARFF vehicle arrived near the runway the controller instructed to wait for three aircraft that were about to land. At 06:20 LT, an ATR 72-600 (PK-WGK) with flight number IW1861 landed and impacted the chisel, which resulted in eight holes in the aircraft lower fuselage. The controller then decided to close the runway operation and instructed the ARFF personnel to enter and inspect the runway. The ARFF personnel found a compressor hose (about 10 meters long), a jack hammer (about 60 cm long) and chisel (about 4.5 kg) on the runway. - The runway inspection that was performed while the runway maintenance has not been finished resulted in the object which were on dark color and found on dark surface did not properly inspect. - The insufficient information regarding the objects and the location might have made improper assessment to the consequences of the runway operation and delaying the object removal. 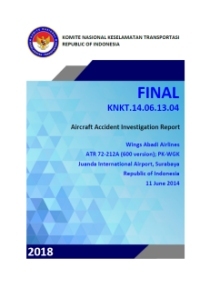 KNKT recommend the Airnav Indonesia Branch Office Juanda to develop procedure of action to be taken by controller after receiving information existence of any obstruction likely to impair the safety of an aircraft operation. Investigation did not find the procedure of hazard identification and risk assessment on assignment of company without experience of performing task on airside. Therefore, the KNKT recommend for developing procedure of hazard identification and risk assessment for assigning the company that did not have experience of performing task on airside. The investigation did not find procedure for runway inspection following runway maintenance or construction work on movement area including the checklist of tool and equipment completeness before and after the runway maintenance. KNKT recommend to develop procedure of inspection following runway maintenance or construction work on movement area. The controller contacted the Airport Operation and Readiness personnel to report of object on the runway but was no replied. KNKT recommend that personnel of each department involve in the operational of the airport shall be available during the airport operation. The Aerodrome Manual Juanda presented without any identification number and the revision status. This made difficult to check the update status of the Aerodrome Manual Juanda. KNKT recommend to include identification number and revision status of manual issued by Angkasa Pura I Branch Office Juanda International Airport. The Aerodrome Manual stated that the operational hours of the airport started at 0600 until 2400 LT however the airport operational initiated at 0500 LT. Investigation did not find NOTAM or procedure to open the aerodrome before operational hours. KNKT recommend to update the manual accordance to the current operation condition. Distance from Lombok International Airport to Surabaya-Juanda Airport as the crow flies is 412 km (257 miles).